When growing outdoors, things are simplified. There is no need for grow lights, hydroponic systems, or environmental equipment, and thus growers need to focus on the few variables that do exist. The most important consideration is the garden soil. Even the best nutrients can be rendered useless if the soil is in poor condition. How do I make the best garden soil? 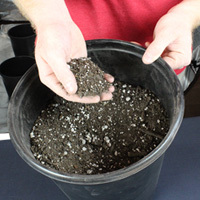 First and foremost, you will need to use a soil test to determine what you are working with. These test kits help determine the pH, NPK levels, and moisture already present in the soil. You may find your soil is rich in certain macronutrients, and you can adjust your feeding schedule accordingly. Knowing the pH of the soil is important, as you will be able to determine what type of pH adjuster to use. Testing the moisture level will give you a good idea of how the soil retains water, and how fast it drains. How do I enrich my garden soil? Once you have an idea of the current condition in the soil, you can take steps to amend it. A garden soil amendment is a compound of organic fertilizers mixed with other ingredients to enhance microbial activity in the soil. When you present organic material into the soil, the new microbial life immediately begins working to improve the conditions in the soil, making a better environment for plant growth. You can also experiment with compost tea, a liquid compost used to improve soil conditions. You can learn more about compost tea here. What are the best garden soil amendments? Lime is an excellent soil conditioner that will help reduce and balance the pH levels. It is simply a ground limestone produce that is available at any hardware store, garden center or supply company. There is no complex science to applying lime and most often two or three light dusting of the entire garden area will increase pH. There are situations, although not very often, where the pH of the soil may be too alkaline or sweet and needs to be lowered. The minerals Elemental Sulphur or gypsum will achieve this but beware that there are certain conditions where gypsum is not as effective. In our experience, it isn’t very often that overly alkaline soil conditions exist, but there are some cases and merits a mention. A calcium deficiency will increase the odds of disease or fungal infestations and this can be remedied using bone meal as a soil conditioner. Bone is rich in calcium and bone meal is a popular and readily available soil additive that will provide this. A healthy, rich soil is the core of any successful garden and taking the time to build and improve it before going ahead and planting will yield far better results. Take the time to develop it before you begin and then continue to sustain healthy soil through good garden maintenance. Healthy soil just doesn’t produce higher yields, but it also reduces the chance of a devastating disease or fungal infection and results in stronger plants. If you have any questions, give our experienced growers a call today at 888-815-9763! Special Price $9.27 on sale until 4/30/2019! Espoma Peat Moss, 8 Qt. Espoma Kelp Meal, 4 lbs. Espoma Organic Garden Gypsum, 6 lbs. Special Price $503.35 on sale until 4/30/2019!